With unique knowledge of the visual system, neuroscience, sensory processing, and task analysis, occupational therapists may be the ideal professionals to address sport performance among collegiate athletes to enhance participation and prevent injury. The purpose of this study was to pilot an evidence-based protocol for use of the Dynavision D2 with collegiate athletes as well as to explore the effectiveness of this protocol. This sports vision training protocol is rooted in scientific evidence as well as theoretical foundations of motor learning, multisensory integration, and cognitive perceptual rehabilitation. The results of this protocol conducted with Division I softball athletes showed decreased reaction time as well as an improvement in the number of hits. Sports performance among collegiate athletes incorporates multisensory, perceptual, cognitive, and motor skills functioning in synchrony to promote the highest level of performance. The premise of visual training, often referred to as sports vision training (Appelbaum, Lu, Khanna, & Detwiler, 2016), is that repetitive and challenging visual tasks promote the necessary skills used in sport and that this intervention will translate to improved performance during competition. Even seemingly minor improvements in these skills may increase performance, setting an athlete above competitors in game play. Although definitive research on how much and what types of exercise are best and to what extent skills are translated to game play is lacking, the efficacy of programs that report improved reaction time has been shown (Bigsby et al., 2014; Cross, Brockevelt, Kruissel-brink, Triplett, & Flett, 2013). Studies have shown not only improved sports performance but also a decline in the risk of sports-related injury (Clark, Graman, & Ellis, 2015; Wilkerson, 2012). One approach to improving reaction time uses the Dynavision D2, a light board used to assess and train an athlete's reaction to central and peripheral stimuli through pressing illuminating lights (Dynavision International, 2018). The light board consists of 64 lights displayed in five rings. Data are recorded for reaction time and number of hits. A tachistoscope located in the center of the board provides opportunities for dual-task challenges through scanning text, images, or numbers and can be graded based on the athlete's performance. Studies incorporating the tachistoscope vary in complexity and consistency. The Dynavision D2 provides alternative strategies for sports training that can supplement other programming or can stand alone, but data on the use and dosage of this technology are inconclusive (Bigsby et al., 2014). Much of the literature cited on the use of the Dynavision D2 to enhance sports performance showed wide variability and limited rationale for use, with most studies reporting varied length, duration, and dosage of use. In addition, the involvement of an occupational therapist as a member of the coach-athlete team is rare. Although the distinct expertise of several professionals is appropriate, occupational therapists may be ideal members of the team, working alongside coaches and athletes and in close collaboration with athletic trainers, physical therapists, optometrists, and other professionals specializing in sports, vision, and athletic performance. For these reasons, it became imperative to design and test a protocol in line with the principles of occupational therapy practice. A sports vision training protocol, developed by the research team, informed by careful review of the literature, and rooted in theoretical models relevant to occupational therapy practice, is proposed. The results of this protocol conducted with Division I softball athletes are also reported. Participation in sport among elite and collegiate athletes involves dedicated time for practice and competition along with commitment that often spans several years of an athlete's life. Thus, engagement in sport is a meaningful occupation as athletes become driven to engage in sport for physical health benefits, for a sense of purpose and collaboration, and to foster a shared mission with teammates (Williamson & Cox, 2014). Sports performance is multifaceted, involving context, various body skills and functions, and cognitive and emotional factors. To improve sports performance, athletes may work with sports psychologists, athletic trainers, physical therapists, optometrists, and other professionals during the season or in preparation for competition. Although fewer athletes may address these or similar skills with occupational therapists, occupational therapists may be the ideal professionals to contribute to programs addressing sports performance, with primary emphasis on the visual perceptual, cognitive, and sensory components of sport. Occupational therapists work to promote a client's ability to engage in meaningful occupations that result in a state of mental focus, reduction in anxiety, and relaxation, leading to dedicated performance. This concept, known as flow, which originated with the work of Csíkszentmihályi (1997), is one of eight mental states that may occur during the learning process. Experiencing flow produces an ideal state for learning, resulting in the highest possible skill level (Csíkszentmihályi, 1997). Elite athletes often experience a state of flow during intense competition (Swann, 2016). To produce a state of flow, an adequate level of both mental and physical challenges must be presented, and ideal training should include an emphasis on physical gains as well as cognitive challenges that are tailored to the skill set of each athlete. Studies of dual-task cognitive loading address one component, but may not incorporate motor learning and physical challenges that are presented in a realistic manner that replicates game play. Visual structures, systems, and skills work collectively during sport. Athletic performance relies not only on acuity and visual field but also on motor planning and eye-hand coordination. Repetitive practice of oculomotor and perceptual tasks builds foundational skills in sports visual performance (Appelbaum et al., 2016). Visual attention, including selective visual attention, obtained from focal processing produces information on identification and differentiation of objects (Zoltan, 2007). Athletes use this critical information to distinguish between stimuli that warrant attention and objects that may be a distraction. Consideration of both selective and peripheral visual attention is needed to successfully carry out necessary daily skills (Zoltan, 2007) as well as among athletes during sport. The Dynavision D2 uses three modes, A, B, and C, to develop visual and motor skills. A fourth mode, D, is used to test visual and motor reaction time. Mode A is proactive and uses lights that illuminate and remain lit until they are hit by the user. Mode B is reactive, and lights illuminate for a preset time before automatically moving to a different and random location on the light board. During Mode C, lights appear in the outermost ring of the light board and travel both clockwise and counterclockwise while the user stands 6 feet from the board and uses only visual skills, taking no action. Mode C is intended to improve visual field awareness and visual pursuit, scanning, and attention. Mode D consists of six different tests (three performed with the right extremity and three performed with the left); each test is completed five times, and an average score is calculated. Few studies have examined use of the Dynavision D2 to improve sports performance among collegiate athletes. Most of these studies are observational and include varying and inconsistent use, with training delivered to the entire team, regardless of individual skill set or performance ability, and with outcomes primarily emphasizing prevention of concussion or other injury (Bigsby et al., 2014; Clark, Ellis, Bench, Khoury, & Graman, 2012; Clark, Colosimo, et al., 2015; Clark, Graman, & Ellis, 2015; Clark, Graman, Ellis, et al., 2015). Mode B, which provides reactive apparatus-paced training, was incorporated into two studies (Cross et al., 2013; Madsen & Blair, 2017). Both studies used a standard .75-second pace for training versus determining adequate cognitive and physical challenge based on individual athlete performance. Research often shows dual-task challenges that incorporate cognitive, auditory, or balance tasks that have been used to enhance sports performance, prevent injury, or help to make decisions about return to play after injury (Bigsby et al., 2014; Clark et al., 2012; Clark, Colosimo, et al., 2015; Clark, Graman, & Ellis, 2015). Combining these approaches with additional cognitive, sensory, and occupation-based models of practice based on feedback from an athlete's performance may provide additional insights. The literature highlights variability and presents challenges for replicability because of inconsistencies in the frequency, dosage, and duration of study procedures. Although one study that was identified was conducted by an occupational therapy team (Cross et al., 2013), no article using the Dynavision D2 has included theoretical foundations addressing sensorimotor integration or involved a protocol to promote individual athlete success. In other words, the intervention was not based on individual performance instead of a pre-established protocol. For this reason, it became important to establish guidelines for use to ensure best practice and application to prevent neurological and visual fatigue and promote motor learning and neuroplasticity. Theoretical and evidence-based foundations are important for establishing parameters and guidelines (Finlayson, 2007). Theories, as outlined below, provided guidance for decisions and revisions during the course of protocol establishment and allowed interpretation of the results of this study. The protocol for enhancing sports performance was established based on principles of motor learning, multisensory integration, and cognitive perceptual rehabilitation, with the use of evidence-based strategies to promote neuroplasticity. Although vision is the dominant sense for sports-related tasks (Ciuffreda & Wang, 2004), training must consider the complexity of the sensory experience of game play, as reflected in this protocol. Table 1 shows a weekly outline of the protocol, including pretesting, familiarization, formal intervention, and posttesting. Motor learning principles guided creation of the protocol. The foundation of the protocol is function and meaning, and tasks are graded from simple to complex. Meaning and integration of functional tasks according to participant needs and motivations are important in the promotion of motor learning (Gutman & Schindler, 2007; Ikiugu, Hoyme, Mueller, & Reinke, 2016; Mathiowetz & Bass Haugen, 1994; Miles Breslin, 1996). For athletes, it is important to understand the importance of sports performance and the motivation to engage in training. Integrating Dynavision tasks within the context of the occupation of sport allowed athletes to acquire and improve skills and strengthen neurological connections, promoting the ability to adapt quickly (Miles Breslin, 1996; Wulf & Lewthwaite, 2016). Athletes learn to adjust their performance based on feedback from the environment (Miles Breslin, 1996), changing inefficient patterns and adapting to improve function (Haith & Krakauer, 2012; Toner & Moran, 2015). Within the protocol, promotion of adaptation was established on a continuum of simple to complex, beginning with less demanding learning conditions and gradually increasing to complex conditions that allowed more opportunities for error over time (Levac, Driscoll, Galvez, Mercado, & O'Neil, 2017). This strategy allowed implicit learning to occur and provided athletes with feedback about success, moving from conscious effort to unconscious and automatic action by increasing the variability of tasks (Levac et al., 2017; Miles Breslin, 1996; Toner & Moran, 2015). This continuum improved confidence in abilities in challenging situations, enhancing effortlessness, automaticity, and focus for high performance (Wulf & Lewthwaite, 2016). Multisensory integration is the ability of the brain to process and organize a variety of sensory information and respond adequately (Schaaf & Lane, 2009). The brain stem, cerebellum, and thalamus, primitive areas of the brain that serve vestibular, adaptively proprioceptive, and tactile functions, integrate and filter information before it is relayed to the cortex (Ayers & Robbins, 2005; Parham & Mailloux, 2015). Habituation within these primitive structures provides unconscious organization and efficiency and allows the brain to organize higher-level skills, such as vision, hearing, attention, bilateral integration, and other specialized functions (Ayers & Robbins, 2005; Parham & Mailloux, 2015; Schaaf & Lane, 2009; Schepers & Benson, 2006). Provision of training and practice opportunities within these primitive sensory areas has been shown to improve motor performance and problem solving (Schaaf & Lane, 2009). Thus, increasing the efficiency of primitive structures can enhance higher-order functioning of cortically directed skills that are required within game play. This protocol was established to refine postural control, balance, and proprioception to improve the complex motor, visual, and cognitive skills required in sport. The dynamic interactional approach builds on sensory integration. Sometimes referred to as the cognitive perceptual approach, the focus is on the ability to register and interpret sensory information from the environment and respond and adapt appropriately and decisively, including insight and error detection (Baum & Katz, 2010; Toglia, 1991). Improvement in cognitive processing capacity improves an athlete's ability to adapt during complex game play. The protocol promoted neuroplasticity by training to improve athletes' processing capacity to allow split-second decision making. Tasks were designed to increase cognitive perceptual demands progressively to allow athletes to remediate and establish skills for motor planning, attention, visual processing, and problem solving. Within reviewed studies, the frequency of training sessions ranged from 10 to 40 minutes per day, with 20 minutes being the most frequent, and 2 to 7 days per week, with 3 days being the most frequent. Duration ranged from 2 to 8 weeks, with 6 weeks being the most frequent (Clark et al., 2012; Clark, Colosimo, et al., 2015; Clark, Graman, & Ellis, 2015; Cross et al., 2013; Madsen & Blair, 2017). Theoretical and evidence-based protocol sessions were structured to grow increasingly complex. To prevent fatigue and frustration with the complexity of tasks, the protocol used a frequency of twice per week, 10 to 15 minutes per session. A 2-week familiarization period allowed athletes to establish baseline skills with the Dynavision and provided a foundation for upgrading to high-complexity tasks intended to improve sports performance. After familiarization, the 6-week protocol was followed; this duration is in line with published research (Clark et al., 2012; Clark, Colosimo, et al., 2015; Cross et al., 2013). This study was designed to explore the effectiveness of the use of this Dynavision protocol in improving the reaction time of collegiate athletes. An experimental single-group pretest-posttest design was used. Approval was obtained from the university institutional review board before initiation of the study. 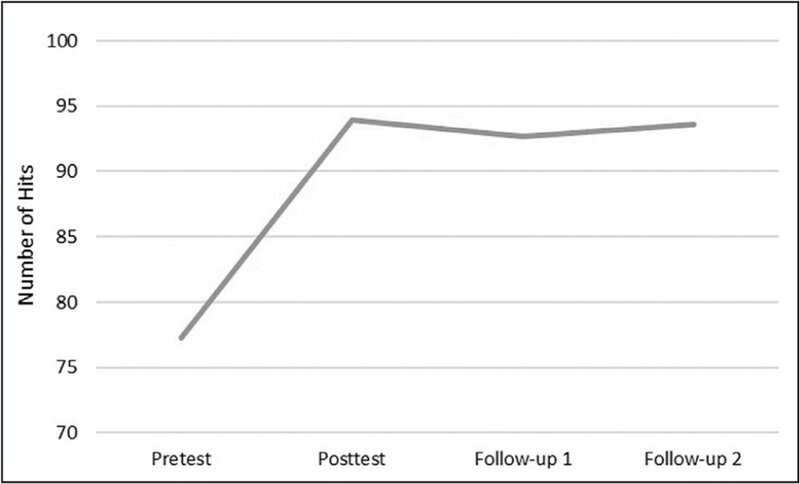 Participants were recruited from a Division I women's softball team in the Midwestern United States by the principal investigators with the use of convenience sampling. Investigators met with coaches and athletes and sent a recruitment e-mail to notify athletes of the study. Participation was voluntary, and informed consent was obtained from all athletes who agreed to participate. Participants were included in the study if they were undergraduate softball athletes older than 17 years. An a priori power analysis was performed for sample size estimation and indicated a need for 10 participants to have 80% power to detect a medium effect size with Cohen's (1988) criteria, with alpha = .05 for statistical significance. Visual screens were performed to provide baseline data. Specific screens included static and dynamic visual acuity, oculomotor function (scanning, pursuits, saccades, accommodation), field of vision, and eye dominance. This testing was carried out according to the procedures described by Warren (1998). Results of screens were indicators of typical performance and were not used diagnostically. The psychometrics of each screen vary, with improvements in reliability found predominantly through instrument-assisted administration completed by an eye care professional. Visual acuity. Visual acuity was assessed with a Snellen chart. In a well-lit area and while wearing corrective lenses if applicable, participants were asked to read each row that they were comfortably able to see. The smallest row that each participant could read accurately from 10 feet away was recorded binocularly and monocularly. An occluder was used to assess each eye separately. Next, noninstrumented dynamic visual acuity was used to assess gaze stability. While seated, participants were asked to read one row larger than their best recorded static acuity. While reading, the participant rotated the head horizontally, then vertically. Presence of the vestibulo-ocular reflex was observed and recorded. A loss of three or more lines from the participant's static visual acuity level was noted as a significant change (Vital et al., 2010). Field of vision. Visual field was assessed with confrontation testing of kinetic perimetry, a method found to be valid for measuring visual fields (Warren, 1998). Materials used included an occluder, a penlight, and a visual target. Participants were seated 1 meter away from the examiner and were assessed monocularly (bilaterally) and then binocularly. First, participants were instructed to fixate centrally on a visual target. A penlight was moved slowly from the participant's peripheral field to the central visual field. Participants were instructed to indicate when the penlight entered the visual field. This procedure was completed at the 3 o'clock, 6 o'clock, 9 o'clock, and 12 o'clock positions and at the diagonals between each. Data collected included field of vision in degrees measured in all visual planes. Oculomotor function. Oculomotor function was assessed with binocular smooth pursuit, convergence, divergence, and accommodation testing. Materials included a penlight, string, a ruler, and a visual fixation target. While the participant was seated in a chair, pursuits were screened with the penlight held in a vertical position 16 inches in front of the participant's eyes. The examiner instructed the participant to maintain focus on the tip of the pen while the pen was moved slowly through nine cardinal directions of gaze: primary, horizontal right/left, vertical up/down, diagonal left/right, and diagonal right/left. Symmetry of the participant's eye movement was observed, with asymmetries recorded. Convergence testing involved measuring the distance for which each participant maintained binocular fixation on a target as it was moved inward. From a seated position, participants were instructed to focus on the tip of the penlight. The examiner observed convergent eye movements and recorded the nearest distance from the nose that the participant maintained before breaking fixation on one or both eyes or when diplopia was reported. Accommodation was assessed through objective notes on each participant's ability to alternate gaze between a near target and a far target. The reliability of oculomotor assessment is variable (Bedell & Stevenson, 2013). Objective measurements and observations were used to screen for abnormalities from accepted noninstrument assessed standards. Eye dominance. Eye dominance provides fixation on an object. Determining dominant eye preference is a primary component of visual processing. Eye dominance was determined with the use of a card that had an 8-mm hole along with a visual design card (Warren, 1998). Participants were instructed to look through the 8-mm hole with one eye while viewing the visual design card that was approximately 16 inches away. The eye that the participant naturally chose to peer through the hole was recorded as the dominant eye. Reliability of ocular dominance testing can vary depending on the procedure and testing distance (Rice, Leske, Smestad, & Holmes, 2008). Dynavision. The Dynavision was used to assess attentional speed (Mode A) and reaction time (Mode D). The Dynavision D2 has been found to be a reliable tool to assess visual reaction time (intraclass correlation coefficient, 0.84; standard error of the mean, 0.033) and reactive ability with Modes A and B (Wells et al., 2014). In Mode A, athletes completed three 60-second familiarization trials with pro-active reaction time (in seconds) recorded on the fourth trial. Mode D used bilateral upper extremities to average visual and motor reaction time for the right and left sides on three tests, respectively. Data from Mode D included visual and physical reaction time, which are described in detail later. Normative data on the use of Dynavision D2 among collegiate athletes using a dual-task paradigm have been published (Bigsby et al., 2014). As shown in Table 1, the established protocol used a frequency of twice per week, 10 to 15 minutes per session. 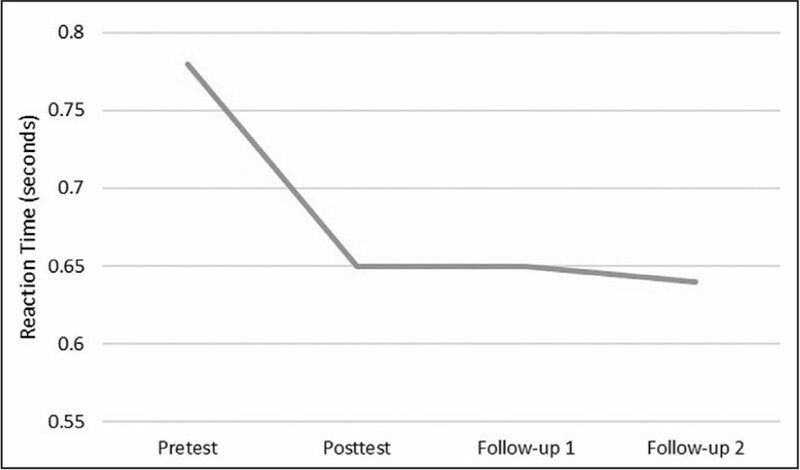 Intervention, pretesting, and posttesting were carried out by five graduate-level students, in alternating teams of two, accompanied by least one principal investigator. The first week consisted of pretesting, using visual screens and Dynavision Modes A and D. After pretesting, a 2-week familiarization period allowed athletes to establish baseline skills with use of the Dynavision to provide a foundation for upgrading task complexity with progression of the protocol. After the familiarization phase, a 6-week intervention protocol was followed. Intervention focused on specific skills in relation to the theoretical foundation described earlier. Promotion of motor learning through tasks relevant to softball increased meaning and improved the athletes' ability to understand how to transfer skills from Dynavision training to softball practice and game play. Vestibular and proprioceptive challenges were used to improve higher-level skills of attention, bilateral coordination, vision, and audition. This was the foundation for providing cognitive and perceptual loads to improve the athletes' ability to filter and interpret incoming information and divide attention appropriately. Each of these was instructed to simultaneously promote improvement of visual and motor reaction speed required for elite softball performance. Posttesting was completed during week 10, again with the visual screens and Dynavision Modes A and D. Follow-up was completed at 1 month and 2 months with Dynavision Modes A and D to assess for skill retention, even though there was no further intervention. Data were gathered according to the established protocol described earlier and were recorded on data collection sheets in a research collection binder. Data collection was carried out under the direct supervision of the principal investigators. A manual was produced from which five graduate-level occupational therapy students were trained by the study authors in the protocol. This manual outlined detailed directions for each session, including testing and data collection procedures. Students engaged in weekly rehearsals to ensure consistency and reliability when assisting in data collection and intervention. During these meetings, graduate research students were required to demonstrate proficiency in data collection and protocol implementation for all weeks that the study was conducted. The principal investigators determined when proficiency was mastered, as indicated by no errors in the data collection protocol. Interrater reliability was not calculated during this process. Data collection involved all five graduate-level research students and occurred under the supervision of at least one principal investigator for every session. The same team of researchers (graduate students and two principal investigators) served as both data collectors and study interventionists. Data were analyzed with SPSS software, version 25. Repeated measures analysis of variance was completed to analyze change within subjects to detect overall differences between related means. Significance (alpha) was set at .05. Mode D data from one participant were extracted before statistical analysis because of a testing run error; this extraction allowed for normal distribution of the data. This study included 11 athletes. During the study period, one participant withdrew from the softball team, and her data were not included in analysis. Ten undergraduate female athletes, 18 to 22 years old, participated in Dynavision training. Of these, none showed atypical results on visual screenings. 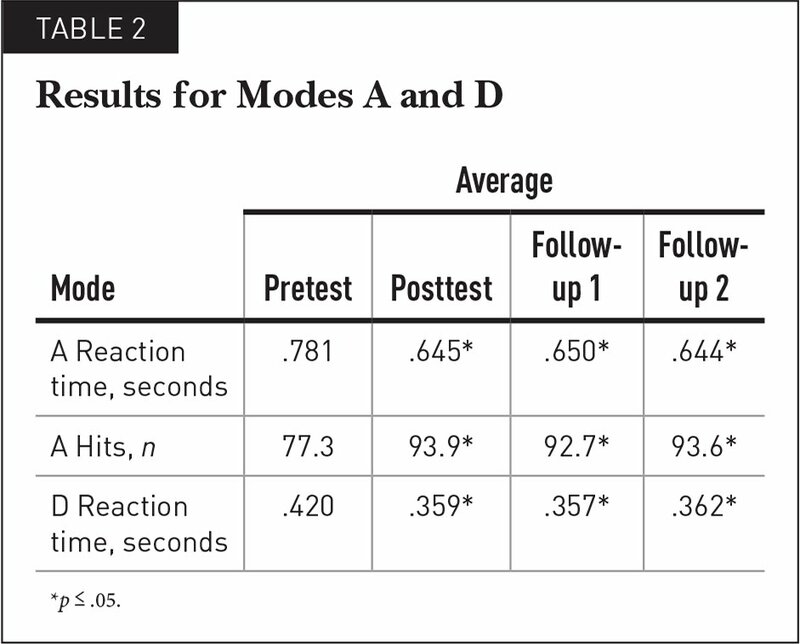 Average baseline scores at pretest showed .78 seconds on Mode A and .42 seconds on Mode D for proactive and reactive reaction times, respectively. Overall results of repeated measures analysis of variance showed that Dynavision use resulted in significant improvement of proactive and reactive reaction times. Data for Mode A speed and hits and Mode D speed did not violate sphericity, and such sphericity was assumed during analysis. Mode A results indicated that athletes improved proactive reaction times, and this change was statistically significant (Λ = 0.03, F(3, 27) = 87.072, p = .000; ηp2 = .906, with observed power at 1.000). Hits within Mode A also improved significantly (Λ= 0.027, F(3, 27) = 79.353, p = .000; ηp2 = .898, with observed power at 1.000). Mode D results indicated a statistically significant improvement in reactive reaction time (Λ= 0.302, F(3, 24) = 8.883, p = .000; ηp2 = .526, with observed power at .987). Changes in hits and proactive and reactive reaction times are shown in Table 2 and Figure 1, Figure 2, and Figure 3. Mode A number of hits. Proactive reaction times improved during the course of the 10-week protocol. This showed evidence of neuroplasticity and motor learning as well as improved ability to integrate and organize multiple sensory inputs. The study participants showed enhanced ability to filter distracting information and attend to important input, which is indicative of neurological organization. They showed improved ability to adapt quickly based on environmental feedback during sessions. The number of lights hit (Figure 2) showed improvement in overall peripheral awareness, scanning, and central-peripheral integration. Follow-up testing at 1 month and 2 months showed maintenance of skill, even though there was no further intervention. The goal of this study was to identify a comprehensive Dynavision D2 protocol to enhance sports performance among collegiate athletes. Further, the authors aimed to trial this protocol and report on findings within a group of collegiate softball athletes. 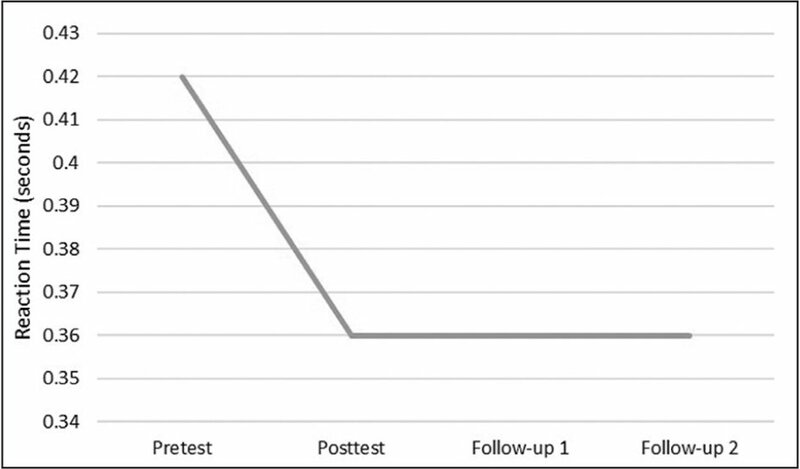 Review of the literature showed few articles on the use of structured protocols within studies aiming to decrease reaction time, improve visual performance, prevent injury, or determine baseline normative data for future concussion baseline data. Several studies reported the use of Mode A (Bigsby et al., 2014; Clark et al., 2012; Clark, Colosimo, et al., 2015; Clark, Graman, & Ellis, 2015). Surprisingly, only two studies included the use of Dynavision Mode B, which is used to improve reaction time (Cross et al., 2013; Madsen & Blair, 2017). Instead, most authors used repeated trials of Mode A at varied frequencies and durations in an effort to improve reaction speed. Both studies that used Mode B interventions used a pace of .75 seconds. In contrast, in the current study, the proposed protocol based Mode B speed on individual athlete performance. Several studies incorporated Dynavision training with other sports vision training (Clark et al., 2012; Clark, Colosimo, et al., 2015; Clark, Graman, & Ellis, 2015; Clark, Graman, Ellis, et al., 2015; Madsen & Blair, 2017). Three studies reported use of a tachistoscope to increase task complexity (Clark et al., 2012; Clark, Colosimo, et al., 2015; Clark, Graman, Ellis, et al., 2015). These studies provided limited information on how the tachistoscope was used. Clark et al. (2012) provided the most information, detailing a single-digit approach that advanced from one to four digits at a .25-second pace. Finally, Bigsby et al. (2014) reported dual-task challenges that were seemingly aimed to challenge solely balance and may have overlooked additional aspects of this intervention for cognitive load and sensorimotor qualities. The described protocol provided advanced complexities compared with studies reported in this article, through the use of cognitive, vestibular, proprioceptive, visual, and sensorimotor challenges tailored to the speed of each athlete. The Dynavision D2 has been shown to be a reliable tool for measuring reaction time among athletes (Wells et al., 2014), and the investigators used it for both testing and training purposes. However, this is a limitation of the study. Although few reliable tools are available, use of an alternative tool for testing would have strengthened the study. Two principal investigators and five trained graduate occupational therapy students engaged in data collection and intervention. The same team of researchers conducted all aspects of the study. Although the principal investigators created a manual, delivered weekly training sessions, and provided direct supervision at each session, implementation of the interventions could have varied slightly. Authors who created the protocol were always present for data collection and intervention. However, interrater reliability was not calculated between researchers. Athletes underwent training during the off-season to decrease confounding variables. Although athletes were able to transfer skills to practice, the timing of training limited the ability to transfer skills to game play. Finally, although the sample size met power calculations for a medium effect size, a larger sample would have improved the ability to generalize outcomes. Future research is needed to expand on existing studies, offering prescriptive use of the Dynavision for a wider pool of athletes. The current study protocol effectively improved reaction time among Division I collegiate softball athletes. This approach should be implemented with a larger sample size, ideally in a randomized controlled trial. Replication of this protocol among athletes in other sports to determine the efficacy of the approach is warranted. Future studies should consider implementing the protocol during preseason or in-season training to measure the effects on occupational performance during game play and to further motor learning and cognitive perceptual transfer of skills. These studies should include longitudinal data to best determine changes in performance that translate to on-field play. Finally, qualitative studies are needed to explore whether this protocol, designed to challenge athletes based on their own performance, resulted in increased frequency of flow experiences during training and game experiences. Use of the Dynavision within sports vision training is increasing. With more athletes and coaches attempting to improve performance, they may turn to protocols that incorporate dynamic visual skills to enhance sports performance and avoid injury. Despite increasing use of the Dynavision within collegiate sports, minimal research shows a well-defined protocol for Dynavision implementation. Results of this study provide implications for future research to expand the scope of this protocol with a larger population to further determine efficacy. Because few randomized trials of the Dynavision have been conducted, the current protocol is ideal for such trials. The authors identified only a single randomized controlled trial (Cross et al., 2013) within the past 10 years that incorporated Dynavision training among collegiate athletes. Implications for education include training for athletes, coaches, and professionals working in these settings in the theoretical foundation of sports performance protocols. Specific discussions of the sensorimotor, cognitive, and visual aspects of these theoretical models should be well understood before a protocol is initiated. Interprofessional collaboration within such environments is needed, especially to include occupational therapists. Results of this study suggest a possible emerging area of practice for occupational therapists, working with athletes to improve performance and safety. This area of practice may provide new avenues for reimbursement of occupational therapy services that are not reliant on third-party payers. Instead, grant or university athletic program funding sources may support therapists in this role through consultation or direct provision of service. In traditional clinical practice settings, the Dynavision constitutes a preparatory method. However, its use with athletes may create a new approach that emphasizes interventions designed for a well population based on enhancing proficiency in the meaningful occupation of sports participation. These interventions provide motivation for clients and help them to engage in daily routines (Richardson, 2018). This consideration is especially important for participation in elite athletics, which require extensive time commitments. Engaging in meaningful interventions when provided therapeutically is motivating and engaging. The intervention has a direct link to the occupation of sport participation and performance, providing additional benefits for occupational therapists to explore. As discussed earlier, sport is a meaningful occupation. When pursued at optimal physical and cognitive levels, sport results in an experience of flow and can contribute to a sense of meaning and purpose. For this reason, athletes may be inherently motivated to engage in such interventions. Through the use of a developed protocol, the authors demonstrated efficacy of this approach among collegiate softball athletes, as evidenced by an overall decrease in reaction time and an increase in the number of proactive hits. This protocol also showed the value of the use of Dynavision D2 training in improving visual and motor reaction times, physical reaction time, peripheral awareness, central peripheral integration, and eye-hand coordination. Unique to this protocol are athlete-driven modifications to Mode B time setting and a theoretical foundation that aligns with the demands of collegiate sport. Occupational therapists who are skilled in the neurological foundation of visual performance, motor learning, cognitive loading, and sensory integration may be ideal members of interprofessional teams working with athletes and coaches. Skilled professionals, such as occupational therapists, must instruct the use of the Dynavision to ensure appropriate use to prevent neurological and visual fatigue and to promote motor learning and neuroplasticity. Future randomized controlled trials are needed to assess the effects of this protocol with the potential to improve reaction time and sports performance. Ayers, J. & Robbins, J. (2005). Sensory integration and the child: Understanding hidden sensory challenges. Los Angeles, CA: Western Psychological Services. Baum, C. M. & Katz, N. (2010). Occupational therapy approach to assessing the relationship between cognition and function. In Marcotte, T. D. & Grant, I. (Eds. ), Neuropsychology of everyday functioning (pp. 62–86). New York, NY: Guilford Press. Bigsby, K., Mangine, R. E., Clark, J. F., Rauch, J. T., Bixenmann, B., Susaret, A. W. & Colosimo, A. J. (2014). Effects of postural control manipulation on visuomotor training performance: Comparative data in healthy athletes. International Journal of Sports Physical Therapy, 9(4), 436–446. Clark, J. F., Graman, P. & Ellis, J. K. (2015). Depth perception improvements in collegiate baseball players with vision training. Optometry & Visual Performance, 3(2), 106–115. Clark, J. F., Graman, P., Ellis, J. K., Mangine, R. E., Rauch, J. T., Bixenmann, B. & Myer, G. D. (2015). An exploratory study of the potential effects of vision training on concussion incidence in football. Optometry & Visual Performance, 3(2), 116–125. Cross, A. K., Brockevelt, B. L., Kruisselbrink, A. R., Triplett, A. S. & Flett, J. M. (2013). The effectiveness of Dynavision training to improve visual motor skills of collegiate athletes: A pilot study. Gazetta Medica Italiana, 172(7–8), 627–634. Haith, A. M. & Krakauer, J. W. (2012). Theoretical models of motor control and motor learning. In Gollhofer, A., Taube, W. & Nielsen, J. B. (Eds. ), Routledge handbook of motor control and motor learning (pp. 7–28). New York, NY: Routledge. Miles Breslin, D. M. (1996). Motor-learning theory and the neuro-developmental treatment approach: A comparative analysis. Occupational Therapy in Health Care, 10(1), 25–40. doi:10.1080/J003v10n01_03 [CrossRef]. Parham, D. L. & Mailloux, Z. (2015). Sensory integration. In Case-Smith, J. & Clifford O'Brien, J. (Eds. ), Occupational therapy for children and adolescents (7th ed., pp. 258–261). St. Louis, MO: Elsevier. Schaaf, R. C. & Lane, S. J. (2009). Neuroscience foundations of vestibular, proprioceptive, and tactile sensory strategies. OT Practice, 14(22), CE1–CE7. Schepers, M. & Benson, J. D. (2006). Understanding sensory integration. OT Practice, 11(14), 17–21. Warren, M. (1998). The brain injury visual assessment battery for adults test manual. Lenexa, KS: visABILITIES Rehab Services. Wells, A. J., Hoffman, J. R., Beyer, K. S., Jajtner, A. R., Gonzalez, A. M., Townsend, J. R. & Stout, J. R. (2014). Reliability of the Dynavision™ D2 for assessing reaction time performance. Journal of Sports Science & Medicine, 13(1), 145–150. Zoltan, B. (2007). Vision, perception, and cognition: A manual for the evaluation and treatment of the adult with acquired brain injury (4th ed.). Thorofare, NJ: SLACK. Dr. Feldhacker is Assistant Professor, Department of Occupational Therapy, Creighton University, Omaha, Nebraska. Dr. Lucas Molitor is Assistant Professor, Department of Occupational Therapy, University of South Dakota, Vermillion, South Dakota. The authors have no relevant financial relationships to disclose. Address correspondence to Diana R. Feldhacker, OTD, OTR/L, BCPR, Assistant Professor, Department of Occupational Therapy, Creighton University, 2500 California Plaza, Omaha, NE 68178; e-mail: DianaFeldhacker@creighton.edu.